- Publisher J. Heinrich Arnold Served for many years as elder of the Bruderhof, a Christian communal movement. Discipleship contains writings, letters, and talks from his forty years of service as pastor, marriage counselor, educator, and parent.Sometimes sensitive, sometimes provacative, but always encouraging, Arnold guides readers toward leading Christlike lives amid the stress and strain of modern life.Perhaps the hardest thing about following Christ is translating our good intentions into deeds. Christ calls us, and when we learn to answer him, but time and again we lose resolve. Is discipleship really possible today? Many of the selections in this book offer answers to specific needs or problems. Others grapple with broader themes such as world suffering, salvation, and the coming kingdom of God. All of them pulsate with conviction and compassion, giving fresh hope to those who find themselves lonely or disheartened in the daily search to follow Christ.Discipleship Study& Leader's GuidesMany of you have already discovered the reading-group potential of Discipleship and asked for a study guide to go with it. We're happy to announce that it's finally here, with a complementary Leader's Guide. We've included everthing you asked for: Study questions, writing space for personal reflections, supplementary bible references, and practical suggestions for applying the text throughout the week. - Publisher Perhaps the hardest thing about following Christ is translating our good intentions into deeds. Christ calls us, and we yearn to answer him, but time and again we lose resolve. Is discipleship possible amid the stresses of modern life? Can Christ bring about lasting change in our lives? How can we be centered on him, when everything seems to pull us apart?^This book offers hard-won insights into the challenges of living for Christ in the nitty-gritty of daily life. Many of the selections offer answers to specific needs or problems. Others grapple with broader themes such as the importance of community. All of them pulsate with conviction and compassion, and all of them radiate hope.^Henri J. M. Nouwen^A tough, prophetic book in a time in which few people dare to speak unpopular but truly healing words.^Richard McSorley, SJ, Georgetown University^Anyone who is interested in union with God in his daily life will find Discipleship valuable. Along with The Imitation of Christ and the Sacred Scriptures themselves, Arnold's writings are a treasure from which flows a spring of living water to nourish the soul.^Spencer Perkins, author, More Than Equals^Discipleship may contain more basic truth than some can handle. But for those who understand that following Jesus means swimming against the stream of popular culture, it will be a source of strength and sustenance. - Publisher Perhaps the hardest thing about following Christ is translating our good intentions into deeds. Christ calls us, and we yearn to answer him, but time and again we lose resolve. Is discipleship possible amid the stresses of modern life? Can Christ bring about lasting change in our lives? How can we be centred on him, when everything seems to pull us apart? This book offers hard-won insights into the challenges of living for Christ in the nitty-gritty of daily life. Many of the selections offer answers to specific needs or problems. Others grapple with broader themes such as the importance of community. All of them pulsate with conviction and compassion, and all of them readiate hope. J. Heinrich Arnold Served for many years as elder of the Bruderhof, a Christian communal movement. 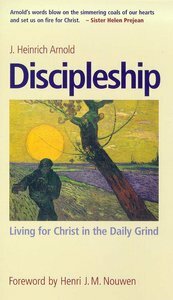 Discipleship contains writings, letters, and talks from his forty years of service as pastor, marriage counselor, educator, and parent.Sometimes sensitive, sometimes provacative, but always encouraging, Arnold guides readers toward leading Christlike lives amid the stress and strain of modern life.Perhaps the hardest thing about following Christ is translating our good intentions into deeds. Christ calls us, and when we learn to answer him, but time and again we lose resolve. Is discipleship really possible today? Many of the selections in this book offer answers to specific needs or problems. Others grapple with broader themes such as world suffering, salvation, and the coming kingdom of God. All of them pulsate with conviction and compassion, giving fresh hope to those who find themselves lonely or disheartened in the daily search to follow Christ.Discipleship Study& Leader's GuidesMany of you have already discovered the reading-group potential of Discipleship and asked for a study guide to go with it. We're happy to announce that it's finally here, with a complementary Leader's Guide. We've included everthing you asked for: Study questions, writing space for personal reflections, supplementary bible references, and practical suggestions for applying the text throughout the week. Perhaps the hardest thing about following Christ is translating our good intentions into deeds. Christ calls us, and we yearn to answer him, but time and again we lose resolve. Is discipleship possible amid the stresses of modern life? Can Christ bring about lasting change in our lives? How can we be centered on him, when everything seems to pull us apart?^This book offers hard-won insights into the challenges of living for Christ in the nitty-gritty of daily life. Many of the selections offer answers to specific needs or problems. Others grapple with broader themes such as the importance of community. All of them pulsate with conviction and compassion, and all of them radiate hope.^Henri J. M. Nouwen^A tough, prophetic book in a time in which few people dare to speak unpopular but truly healing words.^Richard McSorley, SJ, Georgetown University^Anyone who is interested in union with God in his daily life will find Discipleship valuable. Along with The Imitation of Christ and the Sacred Scriptures themselves, Arnold's writings are a treasure from which flows a spring of living water to nourish the soul.^Spencer Perkins, author, More Than Equals^Discipleship may contain more basic truth than some can handle. But for those who understand that following Jesus means swimming against the stream of popular culture, it will be a source of strength and sustenance. Perhaps the hardest thing about following Christ is translating our good intentions into deeds. Christ calls us, and we yearn to answer him, but time and again we lose resolve. Is discipleship possible amid the stresses of modern life? Can Christ bring about lasting change in our lives? How can we be centred on him, when everything seems to pull us apart? This book offers hard-won insights into the challenges of living for Christ in the nitty-gritty of daily life. Many of the selections offer answers to specific needs or problems. Others grapple with broader themes such as the importance of community. All of them pulsate with conviction and compassion, and all of them readiate hope. J. Heinrich Arnold wrote more than 200 inspirational works including In the Image of God and Freedom from Sinful Thoughts. In these works and others, he communicates the idea that love and energy can be found in religion. His messages are encouraging and filled with hope, heartening readers of all ages. Many of his works are written under the name Heini Arnold. Arnold was born on December 13, 1913, in Austria, the son of one of the founders of The Hutterian Society of Brothers, a strict religious sect. He married a spiritual counselor in 1936 and had seven children. He served all of his life as a religious leader and died on July 23, 1982.